The Hilton Honors American Express Business Card currently has an Informr score of 9.4 out of 10. This score is based on our evaluation of 9 sources including reviews from users and the web's most trusted critics. Hilton Honors American Express Business Card is typically available to those with excellent credit scores (650 or greater). 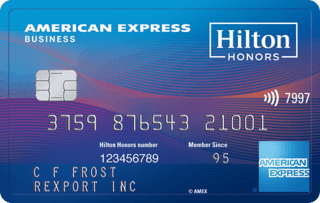 The American Express Hilton Honors Business card makes its grand debut with a large introductory bonus that can amount to a lot of free hotel nights if you spend it strategically. The Hilton Honors American Express Business Card is a good option for business owners who frequently stay, or have employees who stay, with Hilton. If you're after a more versatile credit card, consider other options. If you travel frequently and stay at Hilton properties on the regular, this could be a great card to shoot for since it comes with a lot of tangible travel perks in addition to letting you earn Hilton Honors Bonus Points at an accelerated rate when you spend on certain purchases. - Earn 6 points per $1 on wireless telephone services purchases directly from U.S. service providers and on U.S. purchases for shipping. - Earn a weekend Night Reward from Hilton Honors after you spend $15,000 on eligible purchases on your Card account in a calendar year. - Earn a second Weekend Night Reward from Hilton Honors after you spend $60,000 on eligible purchases on your Card in a calendar year. Business owners that prefer the convenience of the more than 5,000 Hilton Hotels & Resorts properties across 100 countries will likely appreciate the travel perks and rewards of the Hilton Honors American Express Business Credit Card. But if you stay often with Starwood or Marriott, consider The Starwood Preferred Guest Credit Card or Marriott Rewards Premier Business credit card. A good option for small business owners who often stay at Hilton hotels and resorts. It provides a way to earn a lot of Hilton Honors points, much more than you would get for just being a regular Hilton member. The Hilton Honors American Express Business Card is a competitive new business credit card. It comes with a wide range of where you can earn points and a similarly wide range of where you can redeem points. This card is best for small business owners who frequently travel and stay in Hilton Hotels and properties. It’s also best for those who can take advantage of the bonus offer. If you frequently travel or make purchases outside of the US, it can also save you money in foreign transaction fees. The card has a generous sign-up bonus with up to 100,000 Hilton points, gives complementary Honors Gold status as long as you have the card, and makes it easy to earn free nights every year with plentiful point earning options, especially if you use the card frequently.